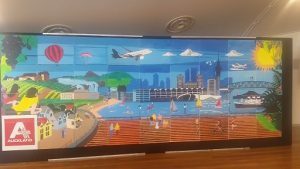 Recently while in Auckland, I participated in a wonderful team building activity – our group comprised of 90 people, split into groups of 5. Each group were given 2 out of the 36 white canvas panels with image outlines; the final picture was not given out. Each group were given tubes of primary colours and brushes. Groups communicated and collaborated to work out who had their surrounding panel images. Colour tones were created/shared with connecting panels to match adjoining panels. Duration was 90 minutes – the finished panels then away to be assembled for a later reveal. At Pre-dinner drinks that evening the group faced a large wall where sheets were pulled away to display the final image and plenty of wows from the participants. Fun, extremely engaging, the final picture far exceeded all expectations, demonstrating what can be achieved when all teams pull in the same direction. Great indoor or outdoor activity depending on weather. At a recent tradeshow in Frankfurt I discovered a great tool for group discussions/Q&A’s, anything really that requires feedback from an audience that is wonderfully tactile, highly effective and very desirable. CATCHBOX is the first throwable microphone for audience engagement. Designed to be thrown from one participant to another, the device is great for conferences, meetings and workshops where passing a normal stick microphone is slow and cumbersome. caught or dropped, ensuring quality audio at every event.